Feng shui is an ancient Chinese practice that is designed to create harmony in your life and home. Literally translating to “wind-water,” feng shui returns the elements to their nature balance which brings relaxation, peace of mind, and refreshment. Feng shui can be applied to every facet of your life, from your home to your work, and even your daily routines. Let’s take a look at one of the most important rooms in your house, according to feng shui principles: the kitchen. 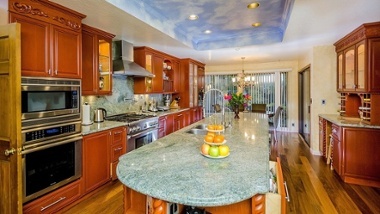 The kitchen is a source of nourishment and comfort for families everywhere, and with feng shui this is no exception. In feng shui, the kitchen represents wealth and prosperity, where there is not only an abundance of food, but luxurious materials as well. Granite is a great example of such a luxurious material. The strength and beauty of granite countertop brings out these essential qualities of your kitchen, while also balancing the “water” energy with “earth” energy. This makes granite a great material to use in your bathroom as well, where the abundance of water can lead to an imbalance in the energy in your home. In fact, granite can contribute to feng shui in your home in a variety of contexts, by balancing out the fire element in your fireplace, or providing a focal point in your home. Not to mention that the natural beauty of the stone itself will bring you joy every day. Check out our granite selections here to choose the stone countertops that will add balance to your life.